In our house we try to eat Paleo during the week. Adapting favorite recipes and new discoveries has been a fun challenge. I have been incorporating a TON more veggies into meals. In an attempt not to get stuck in a rut I have been mixing up the ways I prepare them and I have found some of my new favorite snacks. 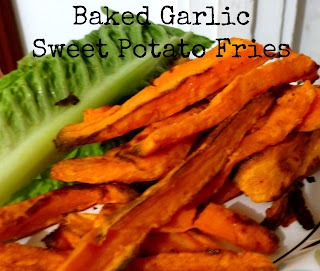 Growing up my mom used to make oven fries so I took her recipe and Paleoized (my new word) to make some fabulous and oh-so-easy baked garlic sweet potato fries. This is now one of the top "go to" recipes in our house! If you are using minced garlic: when the fries start to turn brown, sprinkle garlic on fries and bake for at least 10 minutes more watching them carefully so they do not burn! Let them cook for a few minutes and enjoy! Are you doing the Paleo diet? What are your "go to" recipes?